1. You think you're supposed to wear green? NOPE! Contrary to popular belief and TONS of marketing, the actual historical color for the day is a light blue. Green was only adopted in the 18th century on when the holiday was conflated with the Irish independence movement. 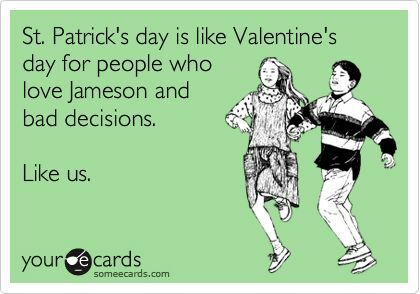 SEE ALSO: Check out all St. Patrick's Day coupons & sales at DealsPlus. 2. St. Patrick was actually Roman, not Irish. Well, WHOOPS. Though he's obviously traditionally associated with Ireland, Patrick was born in Britannia in 387 A.D., and his nationality was Roman. His full name? Maewyn Succat. Patrick was obviously a lot more catchy than Maewyn, though. 3. The Shamrock is actually kind of a religious symbol. The three leaves of each Shamrock are supposed to symbolize the Christian Holy Trinity. Patrick would use the shamrocks to illustrate what Christianity was about — and it worked: He was responsible for a huge wave of conversions. 4. It's actually a huuuuuuuge day for spending (DUH). 5. But — SHOCKER — St. Patrick's wasn't always about drinking. 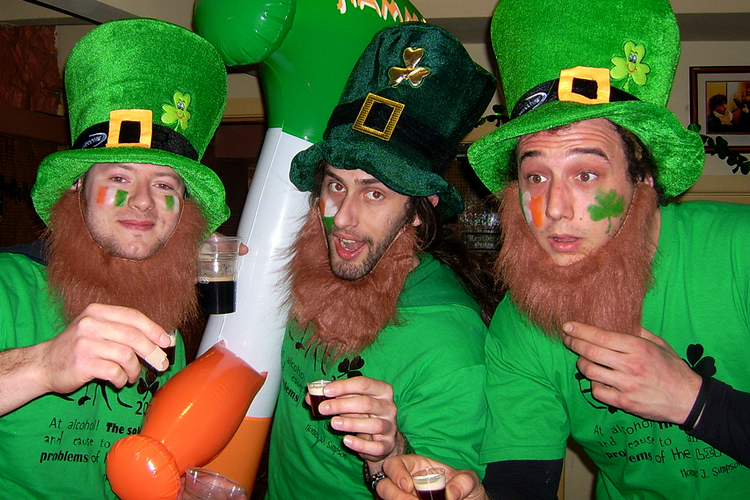 In fact, pubs in Ireland were legally required to close on St. Patricks Day until the 1970s. Now, it's a day that's almost exclusively about drinking. Irish beer company Guinness says that they sell around 7.5 million pints of beer on St. Patrick's Day, which is about double what they normally sell. YUP. That's a lot of hangovers. A lot of the current iteration of St. Patrick's Day comes from the American interpretation of the holiday. Americans helped turn the holiday into its modern incarnation of drinking, partying, and turning public fountains green. 6. For as Irish as it is, the first official Irish celebration of the day didn't actually happen until 1931. Yup, the first state-sponsored St. Patrick's Day parade happened in Dublin in 1931. Weirdly, New York City's parade is way older. New York City has been celebrating St. Patrick's Day in parade form since 1848! 7. Spoiler Alert: St. Patrick never actually rid Ireland of all the snakes. So somebody started the rumor that St. Patrick drove out all the snakes from Ireland, and that's what helped him gain his vaunted sainthood status. But guess what? There never actually were any snakes in Ireland to begin with. The water surrounded Ireland was actually too cold for the snakes to swim through from England. Snakes haven't actually existed in Ireland for THOUSANDS of years. The idea of Patrick banishing the snakes is actually thought to be symbolic of him banishing the druid pagan priests that had been prevalent across Ireland at the time. 8. St. Patrick was probably a slave trader and tax collector before he was, you know, a saint. According to Cambridge University professor Dr. Roy Flechner, who studies Anglo-Saxon, Norse and Celtic history, the real background story of Patrick pre-sainthood was likely that his family were tax collectors, which was a very dangerous profession at the time. Patrick's father Calpornius, said Flechner, transitioned out of the tax collection trade and into the clergy, and then passed his position down to his son. Flecher also believes that in order to initially set himself up in Ireland, Patrick first became a slave trader, as that was one of the few ways to make money at the time. 9. So why do we eat cabbage and corned beef on St. Paddy's anyway? Cabbage and corned beef are actually American innovations on the holiday. Irish immigrants in New York would buy corned beef from kosher butchers and created the dish there. The Irish typically eat lamb or bacon to celebrate. 10. There are more Irish in the U.S. than in Ireland. Around 34 million people claim Irish ancestry in the United States and only 4.2 million people actually live in Ireland. So now that you know the 10 most interesting, funny facts about St. Patrick's Day, we hope you'll enjoy your Irish (and not so Irish) food, green (or light blue) clothing, leprechaun hats, and - of course - that beer and Irish whiskey even more this year!